HAPPY NEW YEAR!!! Who’s ready for some good old fashioned comfort food? One of my favorite meals as a kid was Pot Roast. It’s such a delicious and filling comfort food. My Mom often made it for my siblings and I. I have always enjoyed it because it is so flavorful and colorful. Recently, my Mom mentioned that she had a taste for it but, she didn’t feel like making it. Of course since she mentioned it, I couldn’t stop thinking about it! I recall attempting to make a Pot Roast a few years ago. It was my first attempt…not a good one, yes, I admit that. Anyway, I also recall the error being that I rushed it because we had family coming over…very bad idea! The vegetables were under cooked and the roast was tough! (I apologized profusely). My only saving grace was that it was family and they didn’t complain. I was immensely disappointed in my failed attempt because I knew how good the meal could have been with the proper time and planning. Not to mention the fact that I’m also a bit of a perfectionist. It was certainly a lesson learned! 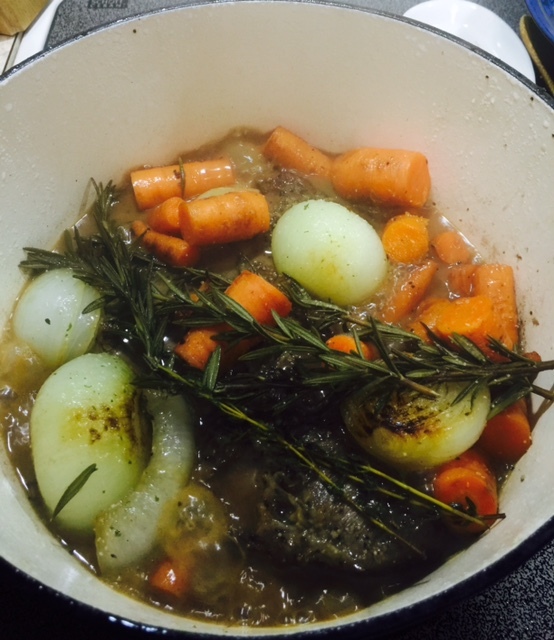 My take away: Pot Roast (greatness) cannot be rushed! So, today I tried a recipe that I found on Pinterest from Baked In the South. I made the recipe as instructed and it was great. It was delicious, tender and flavorful! I may add mushrooms the next time I make it. My cooking time was reduced by about an hour or so because my dutch oven seems to cook pretty fast. I made homemade mashed potatoes to go with it. My family raved over it. This recipe was easy, delicious and great for Sunday’s dinner! Categories: Food, Meal | Tags: beef, comfort food, family dinner, one pot meal, pot-roast, sunday dinner | Permalink.